Tamil is one of the oldest languages in the world, and so is the Tamil culture. However most of the practices that are practiced today were popularized by the Vijayanagara / Nayak kingdoms that ruled this region, incl., the present way of draping the saree - Nivi style, certain rituals & practices and ofcourse the certains types of jewelry as well! 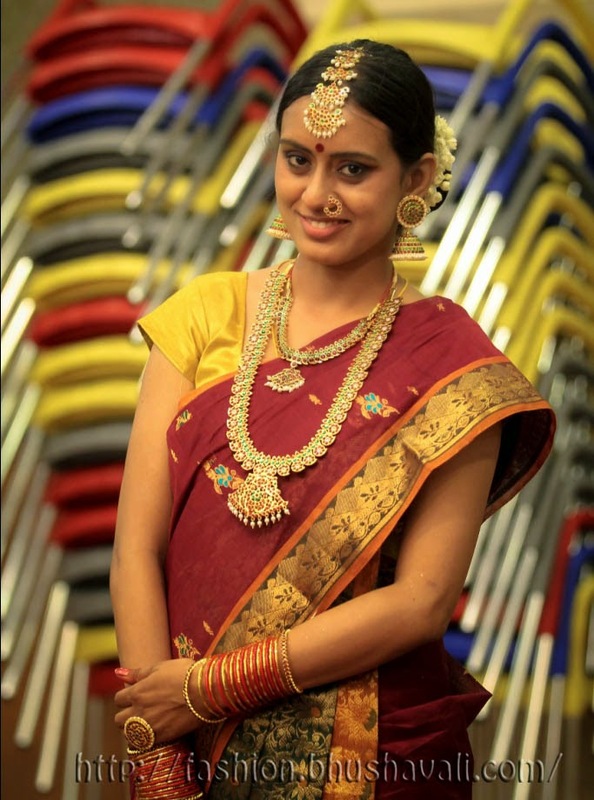 A quintessential Tamil bride is usually seen wearing a 6 yard saree draped in Nivi Style (ofcourse there are some differences depending on communities), and her hair is adorned with Jasmine (malli) and Firecracker flower (kanakambaram) and she is adorned with Temple Jewelry. Temple Jewelry, as the name suggests, was originally for the Gods & Goddesses residing in temples. The designs were derived from temple motifs. Later on these jewelry were adapted by the temple dancers. Later on when Bharathanatyam became a more socially acceptable form of dance, general public too, took up their style of jewelry. Originally Temple Jewelry was made of gold and was embedded with rubies and emeralds with pearls dangling all around. However later on when it became gold plated silver, with rubies, emerals & pearls. Of late, it has becomes golden colored metal with red and green stones with faux pearls to bring down the price and make it accessible to everyone. The various pieces of temple jewelry include, Nethi Chutti, Surya Prabhai, Chandra Prabhai, Raakodi, Kunjalam, Mookuthi, Jhumki, Maatal, Necklace, Haaram, Vanki, Bangles, Rings, Ottiyanam, Anklets etc and when its adapted to wedding, it includes Toe rings and ofcourse Thaali Chain & Thitumangalyam. The Nethi chutti is usually triple, i.e it comes in 3 parts, a vertical section that goes on the hair parting (maang tika) and a horizontal section that sits on the hairline on forehead (matha patti) and a pendant like portion that hangs in centre front. Surya Chandra Prabhai are placed on either sides of it. Raakodi is placed at the crown of the head or over the bun if there’s one, and the Kunjalam is at the end of the plait which is all the more adorned with flowers. The nose ring is traditionally in 2 parts, one worn in cartilage called Bulakku and another on a side. Jumkhi are earrings that have a little umbrella shape and the Maatal holds it around the ear lobe to distribute the weight. The Vanki is worn on biceps. A special type of ring called the Neli Modhiram that’s curved is worn some times. Ottiyanam is the waist belt. Toe rings and Thaali chain are worn by the groom as a part of the wedding ritual. There are several ceremonies that happen in a typical Tamil wedding like Maapilai azhaithal, Sumangali pooja, Reception, Kasi Yatra, Muhurtham, Nalangu etc. spread over 3 days. However off late with the increasing cost of weddings, it has all shrunken to 1 day with some ceremonies skipped. Anyways, Reception and Muhurtham are very necessary and most brides prefer to don a typical Tamil look for atleast one of these 2. Sadly, with the pressure to look the best on the d-day and with the interference of all every family member, sometimes the brides end up overly done, looking like a Christmas tree!!! The cue is to balance. At the end of the day you have to look like a bride and not a Bharathnatyam dancer!!! And you have to look and feel like yourself, or else you may not even identify with the bride later on when you look at your own wedding album!!! If the saree is too heavy and too adorned its better to go simple with the jewelry. If the saree is relatively simpler, going heavy of jewelry is perfectly ok. Even then, the heaviness of individual pieces of jewelry must be balanced. If a triple Nethi Chutti is worn, its better to keep it thin. If it has only the centre part then going heavy shouldn’t be a problem. If its triple and yet heavy as well, its better to avoid the Surya Chandra Prabhai, or the entire head would look too covered up. Also when going for this traditional look, drizzling stickers all over should be avoided. If the triple Nethi Chutti is thin or if its thick but has only the centre part, then a wide jhumki should be perfect to pair, if required, with a very thin Maatal, or still better just skip it. Else a smaller one is preferable, and you could go a bit thicker on Maatal. Wearing 2 nose rings is just not ok for a bride, its ok only for a dancer! Just wear 1 on one side, auspiciously on the left. Ottiyanam or Waist belt could be worn if the look is donned for wedding ceremony and not reception! Vanki is worn on both biceps, however is enough to wear it only on right, coz most probably, left is gonna be hidden by saree’s pallu! The stone studded bangles are inter mingled with glass bangles mostly of maroon & golden colors which are considered auspicious. As the metal gold is considered equal to Goddess Lakshmi and wearing gold below waist is considered disrespecting Her! A typical Tamil bride wears heavy, broad anklets, coz when she lifts her saree a bit to expose her ankles for Ammi Midhithal ritual or while wearing toe rings, the ankles would look too plain!!! Its usually made of silver and has no color. However of late, minakari detailing is very much preferred! Toe rings are traditionally made of silver and are absolutely plain. Its worn 2 in the each 2nd toe. However again these days, broader toe rings with some pattern on them are worn, 1 in each 2nd toe!!! Major care is to be taken if fake hair is used to add length. It must be secured well or it might fall off midst the ceremony. The joint mustn’t show too! Also the way in which the flowers are placed must be taken care of. Wrapping the entire length of hair with 2-3 strands of flowers is so passé. A few strands could be secured atop the plait with a couple of pins. Another idea would be to opt for a bun with the Raakodi on top of it. For a Tamil wedding, a bride would feel more restful with just a bun, coz exchanging of garland happens several times during the ceremony and having a long plait with fake hair is not very comfortable! Finally, last but the most important, the Thaali chain and Thirumangalyam. Actually each family has its own design of Thirumangalyam and the few more adornments that go with it. The number of attachments vary from just 2 to about 10. The shape varies according to community and the design within the shape varies within lineages / families!!! The Thaali chain obviously has to be sturdy enough to bear the weight of Thirumangalyam & its attachments. Once again, the cue is to balance and not go overboard. At times, its ok not to try satisfy everyone and end up looking like a Christmas tree!!!! P.S: Check out my posts on my WEDDING RECEPTION STYLE when I sported this look. very interesting post:) have a nice weekend! very informative post...and I absolutely love these pics...you looked utterly beautiful on your wedding day! Thanks Sindhu. Yeah! Weird name right?!!! Is this you on your wedding day? Lovely photos - I enjoyed the ones of the sculptures and the informative nuggets about the jewellery. Am off to check out the reception day photos too. Congratulations and best wishes to you and your husband.